Fisheries offer both risk and opportunity in disputed waters. While the increasing militarization of the South China Sea strains Asia-Pacific’s stability and security for the long term, the region’s humble fishing fleets pose more immediate, frequent, and less managed risks. If properly organized, however, those same fleets could offer one way to develop a culture of compromise and cooperation. After running a controversial program of land reclamation in the South China Sea, China has recently started to build facilities on its artificial island outposts. Unsurprisingly, neighboring countries remain anxious about Beijing’s ultimate intentions, fearful especially of military threats. But the more urgent concern – to China as much as to its Southeast Asian neighbors – is the likely emergence of even bolder maritime law enforcement and fishing fleets. The latter are ever-more aggressively chasing the South China Sea’s rich stocks of fish, which constitute ten per cent of the global catch. China says it will use its new facilities to support fisheries. Its coast guard is also likely to receive new facilities that will allow it to make more frequent and longer expeditions into the southern reach of the South China Sea, where China’s claim overlaps with multiple countries’ claimed exclusive economic zones (EEZs). Fishing boats and law enforcement vessels – much more than the military – have been at the forefront of standoffs and clashes at sea. The most consequential of these incidents in recent years was the Scarborough Shoal standoff. It began in April 2012 when Philippine sailors boarded several Chinese fishing boats anchored in the lagoon to investigate possible illegal fishing. The fishermen sent out distress calls and were soon reinforced by two Chinese law enforcement vessels. A two-month standoff followed, involving dozens of Philippine and Chinese ships and a major diplomatic crisis. China eventually seized control of the shoal and sealed it off. Manila sought international arbitration against China, chilling bilateral relations ever since. Another fishing incident in 2013 turned deadly: The Philippine Coast Guard killed a Taiwanese fisherman. The incidents follow a pattern. They begin with one country attempting to take enforcement actions against another’s fishermen, often in disputed waters, then escalate into face-offs at sea, and descend into “he-said-she-said” finger-pointing. Even after the standoffs conclude, relations remain scarred. Years ago, fishing boats had few electronic systems to call for help or transmit locations. Coast guard fleets, especially the Chinese one, were underpowered and small. In a pre-social media era, incidents at sea rarely made headlines or stoked nationalism. The offending fishermen were often arrested before they could call in reinforcements. Foreign ministries would intervene. Both sides would follow a practice of prompt release: Rather than being prosecuted, the fishermen would be deported to their home country, often after paying fines or having their catch and boats confiscated, to avoid a protracted diplomatic crisis. Today, encounters at sea are more common and diplomats have neither the luxury of time nor of obscurity. China’s maritime law enforcement fleets have acquired about 100 modern ocean-going vessels in the last decade. Southeast Asian nations are becoming more assertive too. The Philippines, Vietnam and Taiwan have all acquired new vessels. Indonesia declared “a war against illegal fishing” in December and has since destroyed several dozen foreign vessels to show its resolve. Compounding the risks is a pervasive ambiguity. China has not made clear where the coordinates of the nine-dash line lie nor the sovereign rights it intends to enforce within the line. With the latitude afforded by the lack of clarity, the Chinese Coast Guard, driven by patriotic zeal and hunger for authority and budget, is likely to pursue a maximalist approach to enforcement. “The Coast Guard can get everything it wants whenever tensions rise at sea,” a Chinese official said. In the Philippines, an underdeveloped archipelago state, most of the Coast Guard’s capacity is consumed by policing, search and rescue, and disaster relief in waterways between islands. The Navy, therefore, takes on a large share of law enforcement duties in the South China Sea. It was sailors from a Philippine warship that attempted to arrest the Chinese fishermen at the Scarborough Shoal. Manila understands that the use of naval forces appears more menacing and raises the risk of escalation, and is trying to build up the Coast Guard. But money is short, and the Navy reluctant to relinquish its role. The picture is not entirely gloomy. There are some first examples of cooperation between states and there are more opportunities so far unused. For instance, China and the Association of Southeast Asian Nations (ASEAN) have agreed to establish a hotline among foreign ministries to respond to maritime emergencies. Making a hotline work will require a lot more thinking and planning, however. Fishermen and coast guards are not under the direct administration of foreign ministries. In the stove-piped bureaucracies of the region, frontline actors may not see the need to inform their foreign ministry or heed its instructions. And in countries such as China where the foreign ministry is institutionally weak, the official answering the hotline may lack the authority to make the on-the-spot decisions essential to containing a rapidly evolving crisis. It is, therefore, not enough to connect phone lines. Countries need to ensure hotlines remain open at all times and test them regularly. Those who answer the phone must be trained not just to recite their countries’ sovereign claims, but to take fast and concrete steps to deescalate tensions. They also need to ensure that, in each country’s bureaucracy, the path of command and control is clearly established and can be activated speedily in an emergency. Any delay or any detour in communications limits the chance of avoiding escalation and reduces the room for meaningful diplomacy. Moreover, a hotline is only a reactive mechanism. Given the increasing frictions, the region needs a sustainable framework of operation that will reduce the potential for confrontation rather than just a system that manages it after the fact. Fishermen are the least predictable and controllable of actors involved and can spark crises regardless of the intention of the governments implicated. But fishing, too, offers opportunities for cooperation and confidence building. China’s artificial island outposts in the South China Sea will be used to support “fishing services and civil administration offices,” says its foreign ministry. Beijing ought to ensure that its “typhoon shelters, navigation aids, search-and-rescue centers, marine meteorological forecasting stations” are available to everyone who sails the South China Sea and not merely as a springboard for its own power projection. Regardless of the outcome of the sovereignty issues, the fisheries of the South China Sea are and will remain a fragile common resource. Only joint management and protection can ensure sustainable fishing for all. Fragile areas, for example, should be put under a region-wide seasonal moratorium to allow resource recovery. Ultimately, South China Sea states have to reach agreements on amicable, equitable, shared fishing. There are precedents. China and Vietnam have successfully implemented an agreement on the conservation, management, and sustainable utilization of fisheries in the Gulf of Tonkin, enabled by a settlement on boundary delimitation in the area. 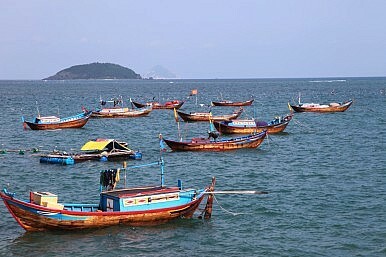 The Philippines and Taiwan are close to agreeing to law enforcement cooperation on fisheries in their overlapping EEZs. Complicated by disputes on maritime delimitation, negotiations on fishing agreements are guaranteed to be hard and politically perilous. But the alternative is frequent and dangerous confrontations threatening the region’s peace and security. Yanmei Xie is Senior China Analyst with International Crisis Group, the independent conflict prevention organization. Shuxian Luo is a graduate student at the Johns Hopkins University’s School of Advanced International Studies.